Tourist-Channel Slovakia - Hrušov Tourist-Channel Slovakia: New homepage! Village of live folklore, alehouses and peach vodka in South Slovakia. 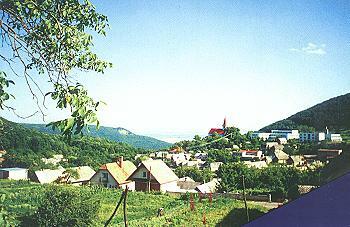 Village is situated in the southwestern part of the district Veľký Krtíš famous for production of qualitative sorts of wine, growing of chestnut trees, vegetables, deposits of brown coal, thermal springs, also for natural beauties, monuments and rich folklore traditions. For this village are typical many secluded settlements with an area of 23km2 where farmplaces form a typical character of the region on the foot of the Krupinská planina. The characteristic atmosphere of village Hrušov make many alehouses carved out into the sand. A lot of quiet natural corners offer many good fishery and hunting opportunities. A rich cultural heritage is preserved in live folklore traditions and customs presented now in festival "Hontianska paráda", also women of middle and higher age wear costumes like their informal clothes.